Lesson Plans Parts List Donate!!! When looking for an experiment, I was looking for one that combined many things. I wanted a cross between science and math class, natural in college, but nonexistent in middle school. I wanted something the students could MAKE, using math and science knowledge. Finally, I wanted it to be cool. Something that would instill curiosity and questions, so the students would want to do the experiment. No lame experiments where you did not care the next day, I wanted to make something mind blowing. Not being able to blow up stuff with kids, I found aerogels. 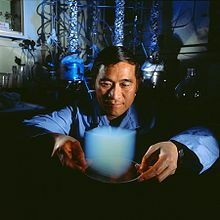 Aerogel has the world record for lightest man made solid. its 99.7% air. It has the best insulating properties and strength to weight ratios. It can also be made in a classroom. Aerogel starts off similar to Jello. Its a gooey gelatin. Imagine the crystalline structure holding it together, with the gooey stuff in between the molecules that hold its form. What if you could take out the gooey stuff, but leave the crystalline molecule structure. Thats what aerogel is. The shape of Jello, with the gooey stuff literally washed out. 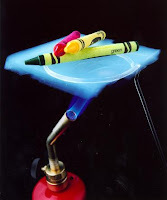 The Jello is a silica solution, and you use acetone or liquid CO2 to flush out the gooey, but when done, you get the lightest substance ever created. It sounded so cool, and the process is relatively safe and kids friendly, so why not do it in class. Then I found out that the autoclave (or dryer) needed to wash out the gooey costs $20,000. Sad, but I was in luck. Apparently, you can make your own with parts from a hardware store for just under $2000. Just as safe, its just a lot smaller. The largest sample you can make is approximately 3cm square. Thats ok, thats all I need. The chemicals are available to the public, as are the parts, so all I needed was the money. Not the best economic timing to ask the principal for a couple thousand dollars for a one week experiment with high pressure, liquid CO2, and an aerospace silica gel byproduct. 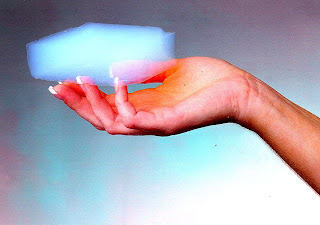 So I created this page, to incorporate all the info about the experiments, the lessons, and make an effort to get everyone else in the world involved in my aerogel experiment. Please, go over the following pages, check the lesson, and donate please if you feel this would benefit students in my classes.